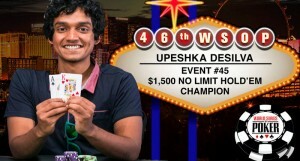 UPESHKA De SILVA a professional poker player and a resident of Katy won event no 45 at World Series of poker tournament 2015. This is his first ever WSOP bracelet. Out of eight players were in the final for the fight of the grand prize where seven players were knocked out by De Silva who won a great sum of $424,577 under his belt. Mr. De Silva was very pleased after winning such Hugh amount while gambling. In His expression and wording, he said that he waited his whole life for doing this and is very amazed after winning his first big WSOP Gold Bracelet in his life. De Silva also mentioned that he and his friends always talk about poker and situations and that is why he managed to get things easy for him in this poker tournament. This was the event no 45 of a total of 68 to be played at WSOP 2015. In this particular game of $1500 No Limit Holdem, a total number of 1,655 players were participating which generated $2,234,250 from the players whereas 171 finalist/finishers got minimum prize of $2,949 each. It was an event gone through many processes and lasted four days to complete. Dara O’Kearny got 2nd position and wins a grand sum of $262,502 under his belt. Whereas John Dolan received third place and won a total sum of $172,752. In the event the 4th place belongs to the player named Patrick Rojek and he concluded a winning of $124,537. The event took place in Vegas, where 1,655 players were participating to the game just to check their luck and to win some handsome amount of money. Many of them were professional poker players whereas some of them were beginners as well. Out of 1,655 players 62 participants were females. A Professional Poker Player from Belarus, VASILI FIRSAU won his first WSOP Gold Bracelet title for the game $3000 buy-in, Pot Limit Omaha. His Total winning from the tournament games is $444,637. He is only the second player from his country Belarus who has won the great WSOP Gold Bracelet 2015. A Total number of 682 players were participating in the game to which Mr. VASILI wins the first prize and a Gold Bracelet. It was an event which ran for to four long days and night to complete. Nipun java won second place and total sum of prize of $270,509. He was a very healthy competitor and was a software engineer before he became a professional poker player. Third Place and a sum of total $171,626 belong to Andreas Freund, a player from Austria. The fourth place belongs to Numit Agrawal. He is a player from Indiana who made his second career final table to the tournament. He won a total sum of $112,717 as cash prize.